When I first started trying to figure out XPages, I had all the default settings and I didn’t fiddle with them. I didn’t know what any of them were for and I still spend most of my time figuring out how to design things rather than how to handle my development environment, but, I am learning. So, on recommendation, I started always doing a Clean and then building just my specific database. Unfortunately, over the course of a day, like any normal Notes developer, I worked on several databases. Sometimes, these were completely unrelated. Why is this unfortunate? Well, my Clean & Build list got sloppy and crowded. Sometimes, in order to make my list look cleaner, I’d close my Designer client and restart it. I knew there was a way to clean up the list without doing that, but it was easy. Now, I would think that having all those projects open would eat up memory and that removing them would somehow free up memory. Heck, I even thought that closing the Designer client would free up memory. It doesn’t appear to do so, but that might just be the random and anecdotal nature of my “testing”. Nonetheless, I wanted a cleaner list, so I fiddled around and, I found what I was looking for. 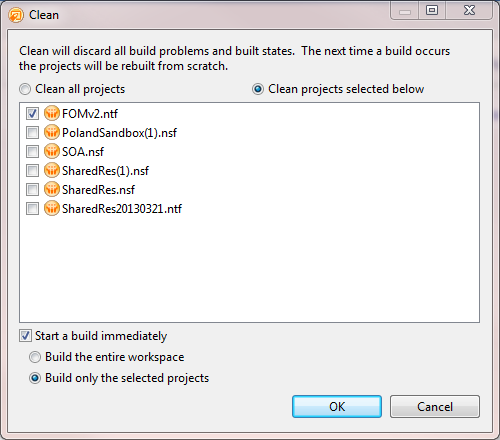 If you use the Navigator view in your Designer’s Eclipse perspective, you can right-click on the one database you actually want to appear in your Clean & Build dialog, then down toward the bottom choose Close Unrelated Projects. Then, your list looks nice and neat. I wish I could say this speeds processing or limits memory use, but the only performance increase I’ve seen is the change to the dialog box. Hopefully, Notes 9 will provide better memory management in this regard, but even if it does not, my need for a neater workspace will compel me to use this process. I’d appreciate your thoughts and comments on this, especially if you’ve any speculation or data on performance improvement using this. Oops! I forgot to mention the biggest reason for closing projects – Search. If you use <ctrl-H> to search your design elements for a string (which I do pretty often) then it will search all open projects. If you have several open projects you’re not working on, you get a lot of extraneous results and it takes far longer to complete. Closing those unrelated projects eliminates the wasted time. David – I agree that it is different mindset in xpages when you have to manage the projects which are open. My personal pet hate is when I forget to close a project on the server and start to build it by accident… sloooooowness. I generally close all projects as soon as I am no longer working on them – it is a pain to have to do but is becoming part of the routine. David and others, please be aware that closing unrelated projects will close any on-disk projects too. 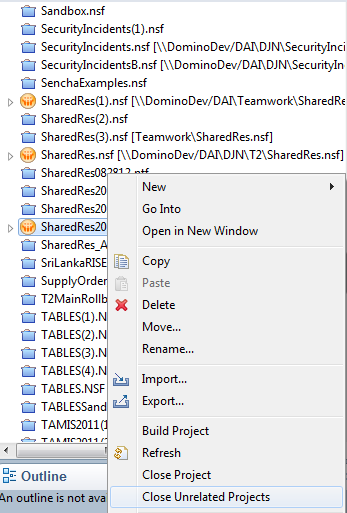 This will stop sync of the nsf with the on-disk project if you have source control enabled.